Leonhard "Leo" Ewert: farmer and minister; born 21 June 1898 in Deutsch-Kazun, Poland. His parents were Andreas Ewert (1858-1929) and Euphrosine (Fenske) Ewert. He was the youngest of 3 children. Leo Ewert married Marie Penner (1896-1928), daughter of Johann Jacob Penner and Margaretha (Epp) Penner in 1920 in Muntau, Molotschna Mennonite Settlement, South Russia. Five children were born to them in Kazun: Eleanore, Helene, Helmuth Siegfried (died young), Helmuth Leonhard, and Siegfried Arno. After his wife’s death in 1928 Leo married Marie Schroeder (26 December 1904, Czattkau, Marienburg, Prussia - 29 November 1989, Abbotsford, British Columbia, Canada), daughter of Wilhelm and Eva (Kliewer) Schroeder on 30 June 1929 in Deutsch-Kazun. They had four children: Johannes (died in infancy), Gertrude (died in infancy), Marie, and Max (died in childhood). Leo died on 6 March 1968 in Abbotsford after suffering three strokes. His funeral was on 11 March 1968 and he was laid to rest at the Langley Lawn Cemetery. Leonhard received an elementary, high school, Bible school and Bible college education. He was baptized on 18 May 1913 in the Deutsch-Kazun Mennonite Church. Leo Ewert married Marie Penner in 1920 in Muntau, Molotschna Mennonite Settlement, South Russia, where he was a teacher. They came back to Deutsch-Kazun, Poland when his father died and he took over the orchard. When in season he brought the fruit with horse and buggy to Warsaw to be sold. Ewert was elected to the ministry by the Mennonite Church at Kazun on 13 June 1920 but did not feel free to accept this call until 21 October 1928. He based his first message on Psalm 25:1-7. In 1940 he was elected to the office of Ältester (Elder). Ewert also worked in the post office in Modlin so he had to stay behind when his wife Marie fled Deutsch-Kazun in 1943 with Helmuth, Siegfried, Marie and Max in a covered wagon with two horses. They arrived in Stade an der Elbe in May 1945, where they lived until September 1948, sharing the house assigned to them with two other families. Leo joined them in 1947. Leo had been able to save some of the church books of the Mennonite Church in Deutsch-Kazun that had not been destroyed during the war. He was therefore able to verify personal information details for members of the Mennonite Church in Deutsch-Kazun that had lost all of their personal records (the remaining books are now stored at the Mennonite Historical Society of British Columbia Archives, Abbotsford, BC). 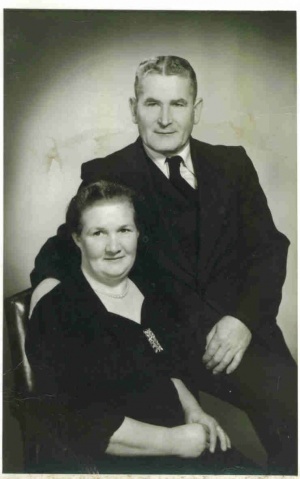 Leonhard served as a minister in Kazun, Poland and in Fallingbostel, Germany, and then immigrated to Canada in November 1948, settling in British Columbia (BC). They first lived in Yarrow and later in Langley before settling in Aldergrove, where he and his wife joined the Bethel Mennonite Church in 1953 when their daughter Marie was baptized. Here Leonhard assisted in the ministry. Leonhard Ewert was known for his short, to the point sermons and remembered and appreciated by many. GRANDMA (The Genealogical Registry and Database of Mennonite Ancestry) Database, 6.02 ed. Fresno, CA: California Mennonite Historical Society, 2010: #136993. Peters, Gerhard I. Remember Our Leaders: Conference of Mennonites in Canada 1902-1977. Clearbrook, BC: The Mennonite Historical Society of British Columbia, 1982: 130. Rehsler, Marie. "Ewert, Leonhard "Leo" (1898-1968)." Global Anabaptist Mennonite Encyclopedia Online. May 2010. Web. 25 Apr 2019. http://gameo.org/index.php?title=Ewert,_Leonhard_%22Leo%22_(1898-1968)&oldid=121038. Rehsler, Marie. (May 2010). Ewert, Leonhard "Leo" (1898-1968). Global Anabaptist Mennonite Encyclopedia Online. Retrieved 25 April 2019, from http://gameo.org/index.php?title=Ewert,_Leonhard_%22Leo%22_(1898-1968)&oldid=121038.